The number one reason people say they can't stick with an exercise regimen is that they're just too busy. Enter high-intensity interval training, or HIIT for short. A growing body of research is showing that bursts of high-intensity activity can get your heart and lungs just as fit in less time, compared with the traditional prescription of 30 minutes a day of moderate-intensity exercise, five days a week. Sounds great for younger athletes, but many older adults worry that this type of fast exercise will cause more health problems than it solves, putting their heart and joints at risk. Here's a look at the research that's been done on high-intensity interval training specifically in older adults with age-related illnesses like diabetes and heart disease. Simply put, HIIT training involves short bouts of intense exercise interspersed with longer periods of slower activity as recovery time. Runners may be familiar with Fartlek or "speed play" training, which originated in Scandinavia several decades ago, based on similar principles. Since then, researchers have tested different interval patterns, varying the intensity and duration of both the all-out and recovery stages. Martin Gibala, chair of the kinesiology department at McMaster University in Hamilton, Canada, is credited with reviving interest in interval training in the mid-2000s. His research demonstrated that interval training delivered the same fitness benefits as moderate-intensity exercise, in just a fraction of the time. More recently, Gibala and his team tested HIIT in eight older diabetic adults, revealing measurable beneficial changes to glucose metabolism, cardiovascular fitness, and body composition, after just two weeks (six sessions). Published in 2011 in the Journal of Applied Physiology, Gibala's data suggest that high-intensity training can be safe, effective—perhaps as important—and time-efficient for adults battling significant health challenges. 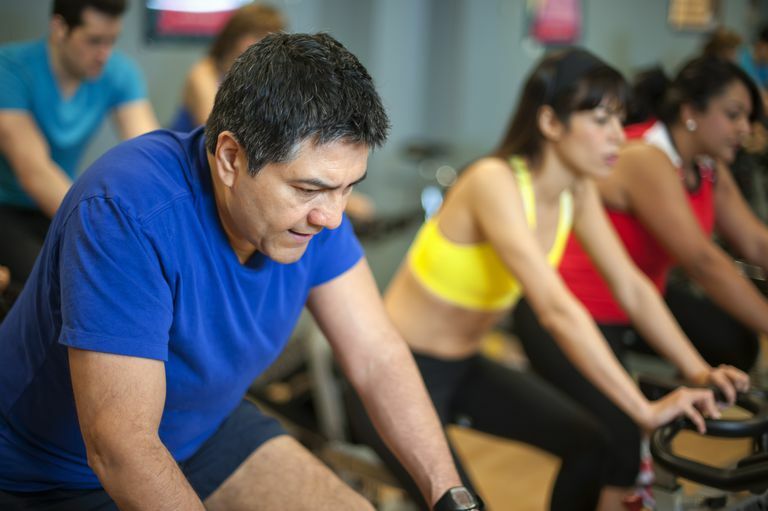 "Our study was small, but the results suggest that HIIT has real potential for improving fitness in older adults, without a major time commitment," Gibala said. While numerous studies have shown the benefits of exercise for adults with cardiovascular disease, most of the research has involved moderate-intensity activity. But some investigations, such as a Norwegian study published in Circulation in 2012, have examined whether high-intensity intervals were safe, or perilous, for older adults with serious heart problems. Gathered from three cardiac rehabilitation centers, the 4,846 subjects suffered from various forms of heart disease ranging from a prior heart attack, angioplasty, coronary surgery or valve surgery, and heart failure. They were randomly assigned to either a moderate-intensity exercise program or high-intensity interval training. Intensity of the exercise sessions was measured in one of two ways: either with a heart monitor or through a scale of perceived exertion. Moderate sessions involved continuous exercise with a heart rate at 70 percent of peak or less; perceived exertion in a range of 12-14, on a scale of 6-20. High-intensity sessions were structured with four 4-minute intervals aimed at 85-95 percent peak heart rate, and 15-17 on the perceived exertion scale, interspersed with slower, "active pauses" at 50-70 percent peak heart rate. The sessions all lasted about an hour, including warm-up and cool-down periods. After putting the subjects through an average of 36 sessions each, the moderate-intensity group had amassed a total of 129,456 hours of exercise; the high-intensity group 46,364 hours in all. One fatal cardiac arrest occurred, and that was among those doing moderate-intensity exercise. The high-intensity group suffered two non-fatal cardiac arrests. The low rate of cardiac events led the researchers to conclude that both types of activity are safe for heart patients but that high-intensity interval training, in particular, should be considered by adults with coronary artery disease, because of its significant benefits for the heart. Likewise, a 2013 review of 10 studies on HIIT in older subjects with conditions ranging from coronary artery disease, heart failure, hypertension, metabolic syndrome, and obesity was published in the British Journal of Sports Medicine. The meta-analysis revealed that greater improvements in cardiorespiratory fitness were found in these subjects involved in HIIT regimens compared with traditional moderate-intensity exercise programs. Cardiorespiratory fitness—assessed by measuring maximum lung capacity—is also a predictor of better longevity. Martin Gibala believes HIIT holds real potential and offers a real exercise alternative for improving the health of older adults. "We know there's much more research to be done on HIIT; by and large the studies have been small in numbers of subjects, and they haven't been done over long periods of time. The traditional model of exercise may be the "drug of choice" with lots of supporting data, but interval training has shown lots of promise in early trials. We're not demonizing traditional cardio guidelines, we just want to say that if people are pressed for time, they can safely consider this different exercise model." The first step if you feel unfit, is to get a doctor's OK to embark on interval training. Then, ramp up slowly. You don't need to hit a target of 95 percent of your peak heart rate, says Gibala. If your daily exercise consists of an after-dinner walk with your dog, for example, he suggests using landmarks like light posts to insert more intense periods into the activity. "Just get out of your comfort zone a bit," he advises. "Say, for these next two lamp posts I'm going to walk a bit faster; you get out of breath, then slow down. You get a slight peak and a slight valley. For some people, that's an interval." Over time—and quite quickly, according to the evidence—your fitness level will improve, you will be able to sustain a higher-intensity effort, and will be able to achieve more of these active intervals. "We tend to use cycling for interval training because it's easy to measure in the lab," Gibala notes. "But you can also use an elliptical machine, swimming, uphill walking; any approach that uses large muscles like those in the legs will work." David P. Swain, and Barry A. Franklin. Comparison of Cardioprotective Benefits of Vigorous Versus Moderate Intensity Aerobic Exercise. The American Journal of Cardiology Volume 97, Issue 1, 1 January 2006, Pages 141–147. ￼Jonathan P. Little, Jenna B. Gillen, Michael E. Percival, Adeel Safdar, Mark A. Tarnopolsky, Zubin Punthakee, Mary E. Jung and Martin J. Gibala. Low-volume High-intensity Interval Training Reduces Hyperglycemia and Increases Muscle Mitochondrial Capacity in Patients With Type 2 Diabetes. J Appl Physiol 111:1554-1560, 2011. Kassia S Weston, Ulrik Wisløff, Jeff S Coombes. High-intensity Interval Training in Patients with Lifestyle-induced Cardiometabolic Disease: a Systematic Review and Meta-analysis. Br J Sports Med 2013;0:1–9. Martin J Gibala. Professor and Chair of the Kinesiology Department, McMaster University in Hamilton, Ontario. Interview conducted by phone January 14, 2015. Øivind Rognmo, PhD; Trine Moholdt, PhD; Hilde Bakken, BSc; Torstein Hole, MD, PhD; Per Mølstad, MD, PhD; Nils Erling Myhr, BSc; Jostein Grimsmo, MD, PhD; Ulrik Wisløff, PhD. Cardiovascular Risk of High- Versus Moderate-Intensity Aerobic Exercise in Coronary Heart Disease Patients. Circulation. 2012 Sep 18;126(12):1436-40. Which Is Better? High-Intensity Intervals or Endurance Workouts? Is Intense Exercise the Best Way to Get Fit? Should You Focus on HIIT Workouts or Steady State Cardio for Fitness?